When Is the Best Time to Plant Tulips in Ohio? When Is the Best Time to Transplant Spring Bulbs? Flower bulbs are among the most popular flowers in the world. 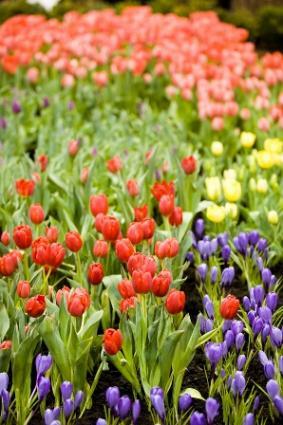 For many, spring-flowering varieties such as tulips, crocuses, hyacinths, and daffodils symbolize the season. They bring welcome color to the bleak landscape left behind by winter. Summer-flowering varieties such as dahlias, begonias and anemones add flair to summer gardens. With proper care and planning, these types of plants can help keep your garden in bloom from early spring through the first frosts of fall. The term bulb commonly refers to plants that store their complete life cycle in an underground storage structure. Some of these plants have true bulbs, while others have similar structures, such as corms, tubers, and rhizomes. Tulips and daffodils, for example, are true varieties, while crocuses and gladioli are really corms. Plants such as dahlias and begonias are actually tubers. Within the bulbs are the plants' leaves, flower buds, and the food the plant will need to flower and thrive. With other plants, new growth begins at or above ground level; bulbs begin new growth underground. They have a period of growth and flowering followed by a period of dormancy when they die back to the ground. For example, spring varieties end their growing season in late spring or early summer. They start to grow again in the fall and flower the next spring. Bulbs fall into two general groups: spring-flowering and summer-flowering. Most spring-flowering types are hardy. These flowers are planted in the fall and can survive cold winters. In fact, most require cold winter temperatures in order to bloom. Many hardy types, such as daffodils, perennialize well and can be left in the ground to flower year after year. Summer-flowering types are planted in the spring. Many are tender and cannot survive harsh winters. To enjoy these plants every year in areas with cold winters, you must dig them up in fall and store them indoors until spring. Some summer-flowering, such as many varieties of lilies, are hardy and can be planted in either fall or spring. Most flowering plants do best in full sun or partial shade. Plant in drifts in your flower beds or shrub borders. Crocuses and some daffodils may be naturalized in your lawn. Early-flowering varieties can also be planted under deciduous trees, because they come up before trees leaf out in the spring. Bulbs require well-drained soil. If your soil is heavy, improve it with organic material such as compost. Forcing to bloom indoors is an easy antidote for the winter blahs. Amaryllis and paperwhites are spectacular flowers that are incredibly simple to force. Other plants such as tulips, daffodils, and crocus require a cooling period to force into bloom.